What do you think when you hear the phrase “health and social care integration”? If you work in or around British care services, it’s a phrase you’ll have heard so often you might no longer think about its meaning. Scotland’s chief nursing officer, Fiona McQueen, hears it as much as anyone — but she is thinking about what it means. The occasion celebrated and explored next steps in a three year collaboration between the Scottish government and the Buurtzorg Britain & Ireland (a partnership of Public World and Buurtzorg Nederland) to support person-centred neighbourhood care. The gathering brought together representatives of several NHS, local government and charitable organisations that have joined in the initiative co-ordinated by Healthcare Improvement Scotland and originally inspired by a visit to Edinburgh of Buurtzorg founder and CEO Jos de Blok. It has produced inspiring innovation across Scotland, from the Borders to the Western Isles, and some of those who have led those initiatives caught the attention of Fiona McQueen yesterday precisely because ‘health and social care integration’ was not their preoccupation. They had shared “amazing stories of person-centred care, which is good for the people being supported and good for the practitioners,” she commented, addressing a key issue that has run through our experience of the last three years. Though inspired by Buurtzorg, Scotland’s Neighbourhood Care initiative has developed alongside implemention of legislation requiring NHS and social care organisations to integrate their efforts – and sometimes the two objectives have not been well aligned. Who would disagree that the distinction between health and social care is an artificial one, and If you want person-centred you do indeed need to remove barriers between them. The problem lies not with that concept but with interpretation. Think of a telescope. Depending on which end you put to your eye you will see a very different picture of the same thing. Similarly, with integration of care services it makes all the difference whether you start with the perspective of the person needing support or that of the organisations providing it. When four nurses created Buurtzorg in the Netherlands 12 years ago, their intention, as Jos de Blok has put it, was “to start again fron the patient’s perspective and simplify the systems”. Guided throughout by that intention, they have grown Buurtzorg to more than 900 self-managed teams. It works not because nurses, home care workers and allied health professionals are all in the same organisation – they are not — nor because their employers have set up joint boards, committees or whatever other institutional parapheranalia has been created for ‘integration’. What matters is that the frontline professionals – whoever employs them – have sufficient autonomy to make, sustain and activate relationships across organisational and professional boundaries as necessary to provide the supports needed. Organisational reform certainly is required to sustain person-centred care, but it needs to be driven and shaped by what frontline professionals need to provide it, in much the same way as the their contributions should be driven and shaped by the needs of the people they support. 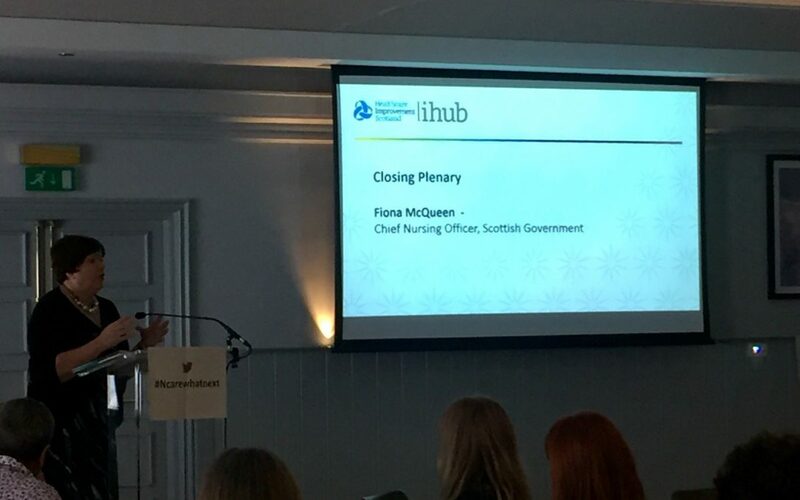 Yesterday’s event closed with an inspiring video of interviews with nurses, care workers, their organisational leaders and some of the people they support in the Scottish Borders. They spoke with calm authority of how they had made the local relationships needed to provide support holistically. Others in Scotland – and elsewhere in Britain – are doing the same, but their focus is not on organisational integration or indeed self-management for its own sake. Primarily, it is on the needs and aspirations of the people they support — organisational form follows that function. If primary purpose is not the starting point for organisational change, don’t be surprised if health and social care integration adds yet more complexity rather than enabling simplicity. And that in turn risks frustrating person-centred care rather than enabling it.